[www.inewsguyana.com] – An Arizona mother has admitted to suffocating her 13-year-old daughter and trying to kill her other children by poisoning them, police said Tuesday. Officers in Casa Grande, Arizona, responded to a 911 call on Christmas Day. A man said that his ex-wife, 35-year-old Connie Villa, had stabbed him but that he had managed to escape and was driving himself to a hospital. When officers arrived at the home, they found Villa with stab wounds, holding a knife to her chest. They managed to subdue her and conducted a sweep of the home. Police found the body of Aniarael Macias, Villa’s daughter, in the bathroom. “Although an autopsy for Aniarael was conducted … the results of which did not identify a cause of death, investigators feel the evidence found at the scene of the crime along with interviews and medical information of the surviving children, give our Department cause to believe Connie Villa was attempting to end the lives of all of her children and her ex-husband, Adam Villa,” police said in a statement. 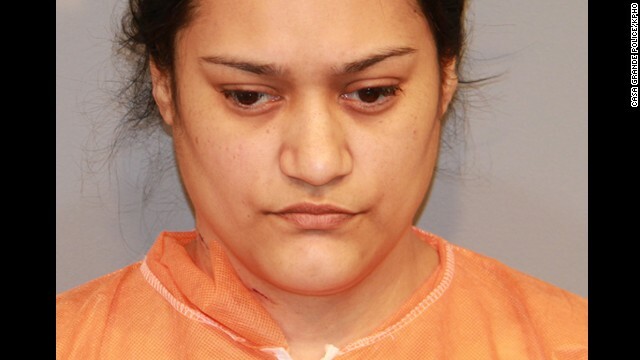 Connie Villa faces one count of first degree murder in the death of her daughter. She is also being charged with four counts of attempted murder of her ex-husband and her three surviving children, ages 3, 5 and 8. In an interview, she admitted she tried to kill her children by forcing them to ingest prescription narcotic drugs, police said. The kids had trace amounts of opiates in their systems. Police also said that she told them she was unsuccessful in forcing her oldest daughter to ingest the drugs, and so she suffocated Aniarael. Connie Villa reportedly told investigators she wanted to kill her children and ex-husband because she did not want him to have custody of them. The surviving children are all in good condition and were placed with the family of their father, Adam Villa, 33. He is in stable condition. Connie Villa was released Sunday from Maricopa Medical Center, where she was treated for what investigators believe were self-inflicted stab wounds. She was arrested the same day. According to Thomas Anderson, a police spokesman, she has made an initial appearance in court. No bond was given. Aniarael’s father released a statement asking for privacy and prayers. “On behalf of Michael Macias, Ania’s father, Vera Macias, Ania’s grandmother and extended family, we request that the focus of this tragedy be a celebration of our precious Ania’s life. She was a gentle, kind and beautiful spirit who was taken from us much too soon. Michael and his family are heartbroken,” it read.